Roast pork belly is the classic Cantonese recipe that will satisfy even the most critical connoisseur. Chinese roast pork is famous for its crackling skin and the aromatic meat. 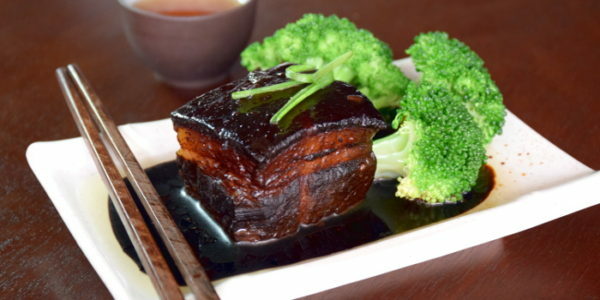 Chinese roast pork belly is so popular in Asia that there are chefs specialized in roasting pork in restaurants. However, it is already a daunting task to roast pork on the barbecues pit, not to mention to cook the whole pig over an open fire as in the Chinese restaurant. I would like to introduce a much simpler way to do it with just the oven. It is hassle free and easy to replicate. Although oven-baked is not the method used in restaurants, it just needs a few easy steps. The result is comparable to any roast pork belly from the Chinese restaurant. 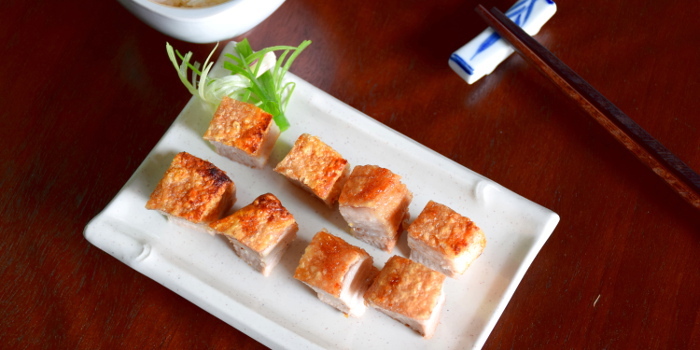 The allure of roast crispy pork belly lies in its simplicity. You only need several ingredients and follow a few steps, and the result is almost guaranteed and fail-proof. The crackling sound of biting into the crispy skin fresh from the oven is sufficient to make you drool nonstop. The oven will do the bulk of the work. And best of all, most of the work is passive cooking. You can marinate the pork and leave it in the fridge overnight, then roast it in the oven to toast. After all, you will be rewarded with the irresistible aroma of the roast pork belly, enjoy the crackling, firecracker-like music as you slice the meat and eat it. Note: This Chinese roast pork belly is called 烧肉, translate into English as siew yoke, siew yuk or siu yuk which means the same thing. 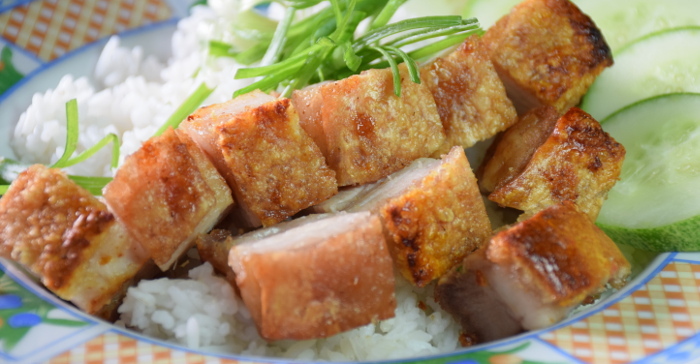 Eating Chinese roast pork belly (Siu Yuk) is no longer just a guilty pleasure. According to a report by BBC published on 29 January 2018, pork fat is a good source of B vitamins and minerals. Pork fat is more unsaturated and healthier than lamb or beef fat. Rich in oleic acid and monosaturated fat, it is beneficial to our heart, artery, and skin. Note: There are many small steps in the instruction section. However, each one is relatively quick and easy to accomplish. A mouth watering Chinese roast pork recipes popular in China and all Asian countries. Wash the pork belly. 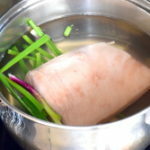 Place the pork, ginger and spring onion in a pot. Add enough cold water to just cover the pork. Heat it up over medium heat and boil until the color of the meat starts to change. At this stage, there will be no blood oozing out when the meat is pressed with a pair of chopsticks. At this stage, the meat is about 70% cook. It takes 10 to 15 minutes. Pat dry the pork with a kitchen towel. Scrape the skin with the knife to remove the impurities and hairs. Use a fork, bamboo stick or the tip of a sharp knife to prick holes on the skin. Rub ingredients in C on the skin. Make a few shallow cuts on the flesh side in a crosshatch pattern. Rub ingredients B into the meat and the sides of the pork. A simple marinade is sufficient to let the flavor of the pork stands out. Use light soy sauce always. Dark soy sauce is not suitable. Leave the pork in the fridge and let it sits for at least 4 hours or overnight. Remove it and discard the remaining marinade. Prick more holes on the skin if necessary. Place the pork skin side up on a piece of aluminum foil. Wrap the sides but leave the skin side exposed. Cover the entire skin surface with sea salt. Bake it at 250°C (480°F) for 30 minutes. 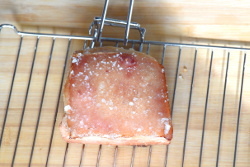 Remove the salt crust on the surface. Broil for another 15 minutes at 250°C (480°F) without the sea salt and then 10 minutes at 200°C (390°F) until the skin is puffy and crispy. You can hear the crackling sound! Let the pork rest for five minutes. Carve it into bite-size pieces, arrange on a platter. Serve. The quantity of Chinese five spices powder, baking soda and white pepper powder are too small to measure with a digital scale. Therefore, I only measure them with a spoon. Always purchase the pork belly with the skin on. This skin is the best part of the pork, which is crispy and crackling. 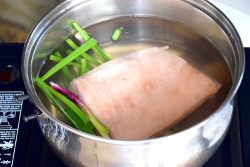 The purpose to cook the pork belly in water for 10 to 15 minutes is two folds. First, the pork will absorb the water and become moist and tender after roasting. Secondly, it removes the undesirable meaty smell. Prolonged cooking will shrink and distort the shape of the pork. There is no undesirable consequence of pricking too many holes on the skin. In contrary, too few holes will not produce crispy skin. Prick shallow holes. Do not penetrate the fatty layer. The holes must be small to produce crispy skin. You can do this with the tip of bamboo sticks, a small fork or a meat tenderizer (those with many sharp needles). Make a few shallow cuts in the crosshatch pattern on the flesh of the pork. The marinade can penetrate easily into the interior of the meat through the cuts. Seasoning B is for the flesh and the sides of the pork. Avoid the seasoning from wetting the skin as wet surface and it will take a longer roasting time to become crispy. There are two reasons to keep the pork in the fridge for at least 4 hours, or overnight. There is enough time for the marinade to penetrate the interior of the pork that it becomes flavorful. Secondly, the surface of the skin is dry enough to produce a crispy skin. If you prefer the conventional method, dry the pork by hanging it upright with a hook and place it in front of a fan for a few hours. Air dry is the preferred method used by traditional chefs to dry Peking duck. 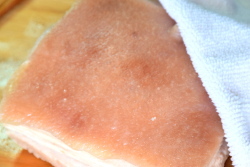 The sea salt that covers the skin seals the moisture and gently steams the pork in its juices. It also helps to season if but will not yield pork that is too salty. This method can produce pork that is invariably moist, succulent and bursting with flavor. Start baking the pork at a high temperature will make the skin crispy. Reduce the heat later to roast the pork slowly to cook off most of the fat, leaving the soft and tender pork marbled with velvety fat. 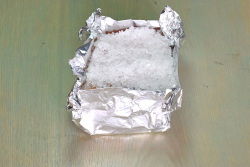 In the first 30 minutes, the aluminum foil protects the sides of the pork from overheating by direct heat. Subsequent roasting without the foil will turn the side to brown. The final stage of broiling is to help to make the skin puffy and crispy. Note: If you like roast pork belly, you will also be interested to try my recipe on Braised pork belly with taro and Braised pork belly (Dong Po Rou). 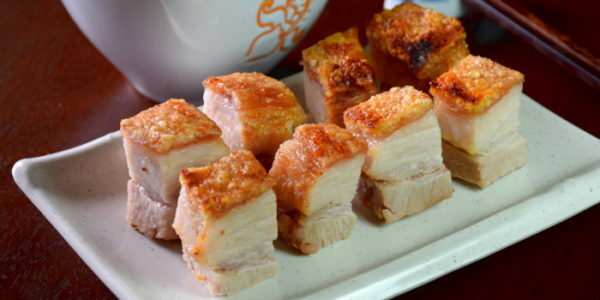 21 replies to "Roast pork recipe- Chinese style (烧肉/ siew yoke)"
Hi, this is KP Kwan. I am happy to see you in this comment section. I ‘m glad to reply any questions and comments as soon as possible. So delicious ! Crispy crackaling, the meat most juicy and fat just melts in the whole mouthful 🙂 Super easy when following your detailed instructions, very please with the result. Both thumbs up! So happy that you make it and enjoy Have a wonderful day. I want to make the dim sum dish of bean curd skin around ground pork, mushrooms. And recipes that you could share. I do not have that recipe right now but will consider it as one of the topics for my future posts. Don’t they put Hoisin sauce and oyster sauce on the meat side? 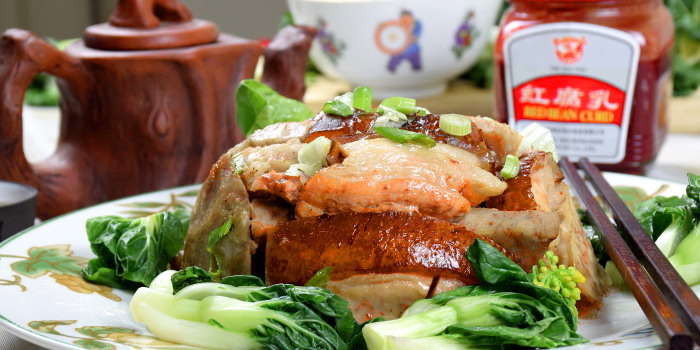 The recipe is the traditional Cantonese-style roast pork, and therefore Hoisin sauce is not used. There are many versions of roast pork, and the use of Hoisin sauce is something interesting to look into indeed. Your Pork Belly is at 700 grams. If I use a 1 kg cut.. am I correct to say that the whole recipe marination preparation to cooking time to increase proportionately. Sry to take up of your time. Thanks n Best Rgds , Sunny Lim. Certainly. Just increase the amount of all the ingredients in the recipe proportionately. Since bigger cut heavier.. the duration in the Oven should be increased too.heat temp remain same. Please advise. Mr Kwan. Thx. You will expect a longer time in the oven. However, each oven behaves differently. The timing in the recipe is only for reference only. I suggest you can decide when to stop roasting in the oven by observing the color of the skin. This is a Good Point that you had mentioned. By observation n visual if is still not too ready then needs more time in the Oven. I did tried twice on this recipe the results were quite acceptable happy. Am just trying to improve further. WI’ll read up further on what you had highlighted. Big Thanks Mr Kwan… Cheers. This is the first time I’ve ever commented on a recipe anywhere…must say this recipe is simply amazing. I’m a huge fan of Siu Yuk but, finding a good one in a restaurant isn’t an easy task in NYC. This scratched my itch and totally blew me away. It’s exactly the flavor I dream about when I think of roast pork and SUPER easy to make. This is 100% joining my repetoire of dishes and will be made again soon. Thanks so much for reading my recipe. I hope you will enjoy the siew yok / Chinese roast pork as much as I do.